In the immortal words of John Cleese ...and now for something completely different. O.K., more like completely different horrible. But, has to be said, it is a bit girly ! 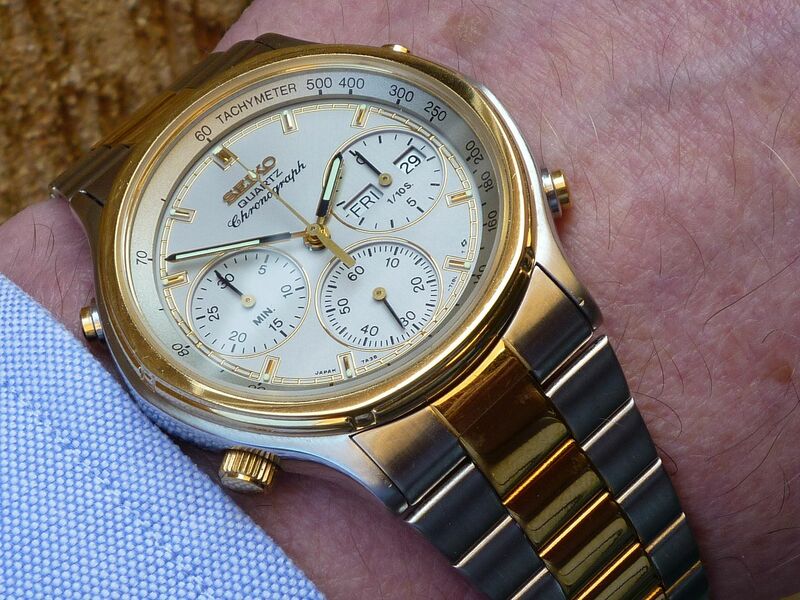 My newest incoming non-Seiko 7A38 - a Kamatz 507000 - the (much) reduced 36mm diameter boys / ladies version, which I picked up on eBay in the States a couple of weeks ago, for under $30. It arrived yesterday and is pretty much as received (save for the black muck that came out of the bracelet after an overnight soak). In the past, I've painstakingly repainted the bezel markings on the larger versions (both 517000 and 518000), but I shalln't bother with this one. Instead I'll just transfer the dial / movement into a NOS case. 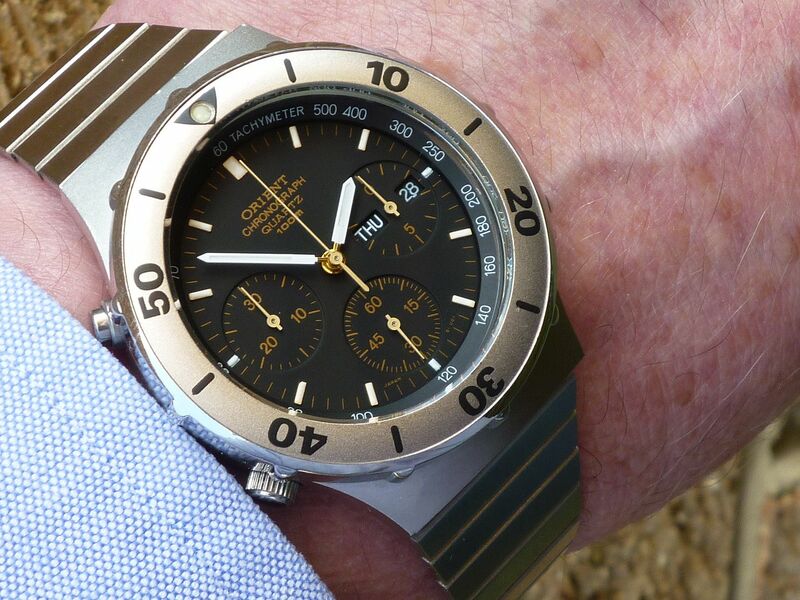 Oh, and excuse the bezel misalignment foul - the plastic detent mechanism is totally knackered and it just spins around. Whereas the two-tone aftermarket bracelet works reasonably well, once I've swapped the case, I'll probably end up fitting a leather strap. 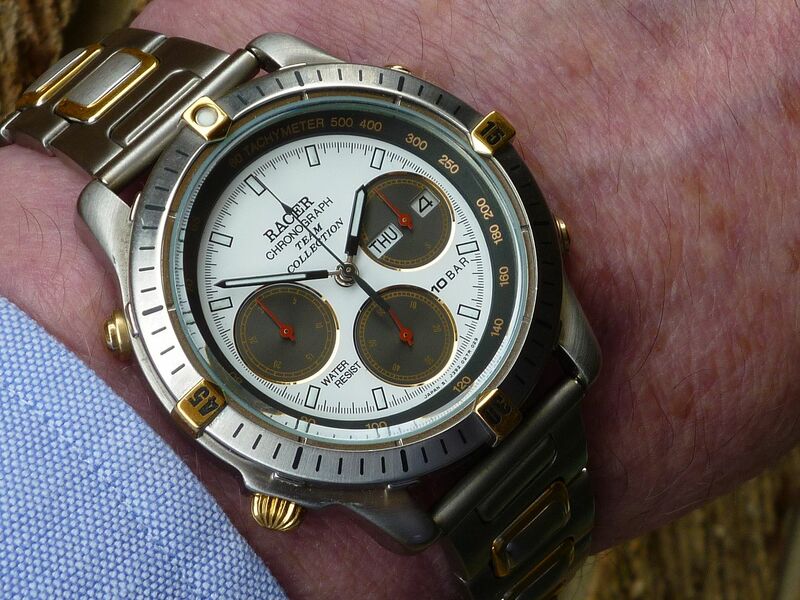 So finally, some 2½ years later, I did eventually get around to swapping the dial / movement from that beaten-up 'Baby Panda' Kamatz 507000 into the NOS watch case it deserved. This morning I fitted the leather strap I'd been waiting for. 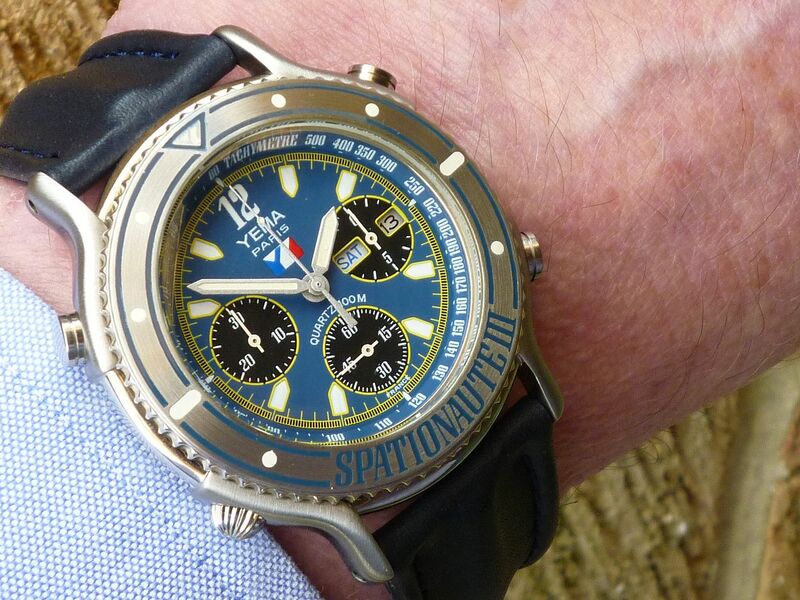 Subtitled: Does my wrist look fat in this ? Part 2. This Kamatz 507000 'Reverse Panda', which arrived from the States a couple of weeks ago (see this other thread) is what rekindled my interest in these smaller 'reduced' Boys / Ladies versions. So I'm just giving them both a quick trial fitting. Enough of the Yiddisher Fugly Frog (girl's) watches already. So here's something a tad more conventional - a stainless 7A38-727A SAA131J. I bought this off eBay Germany at the beginning of last month and it's been sat around in the queue awaiting fettling ever since. It was listed in the last week of January by a 'James Bond' keyword spamming seller as low-start 7-day auction. 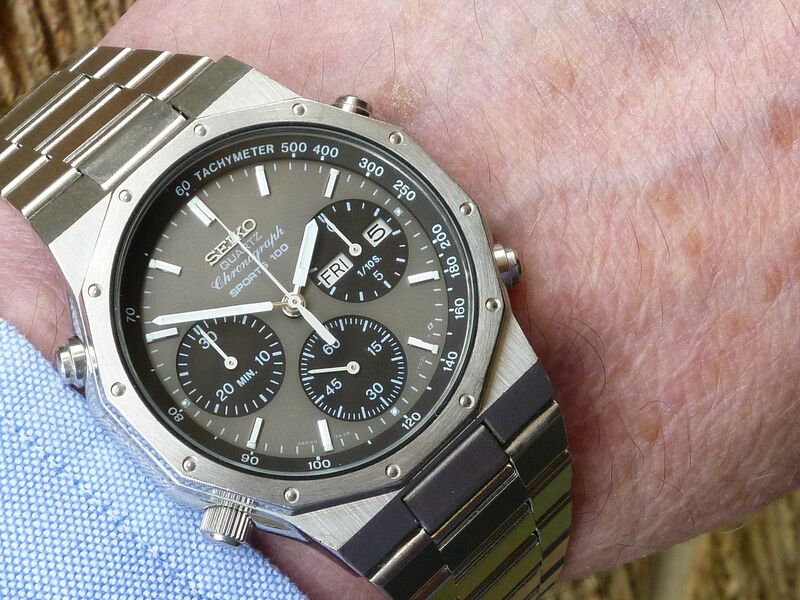 If you check the original listing, you'll see that the seller's photos were all pretty dark - and that it was fitted with one of those horrible Speidel Fix-o-Flex replacement bracelets. But oddly, the watch case looked almost mint. 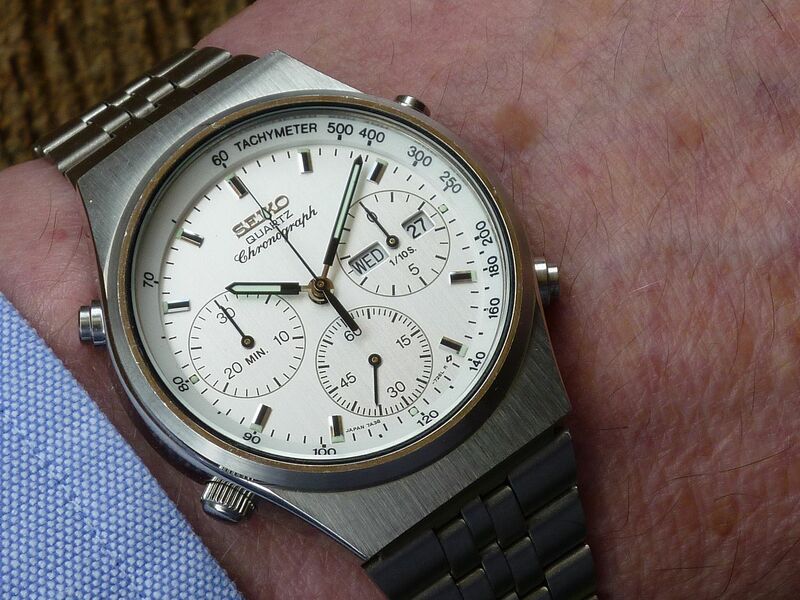 As I already had a stainless 7A38-727A in my collection, in decent condition, I wasn't too bothered. I bid it up to 67.89 Euros and was planning to leave it at that. I was outbid a couple of days later, checked the bidding history and recognized the eBay ID of someone who'd outbid me - one of the regular German eBay profiteering re-sellers. I decided at that point he wasn't going to make a profit from this one. 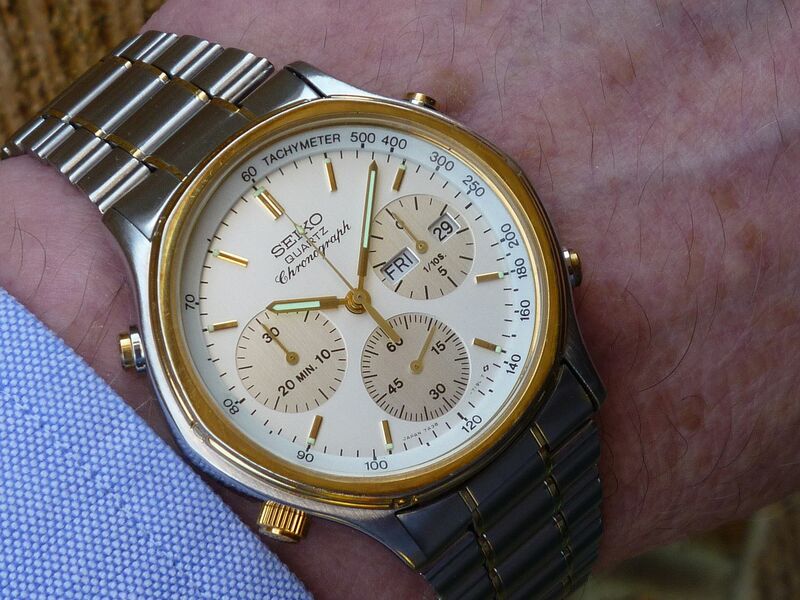 It's now fitted with the correct original Seiko p/n B1615S bracelet (I had the makings of one spare). The watch case turned out to be in almost unmarked condition and the pushers have that 'like new' clicky feel to them. 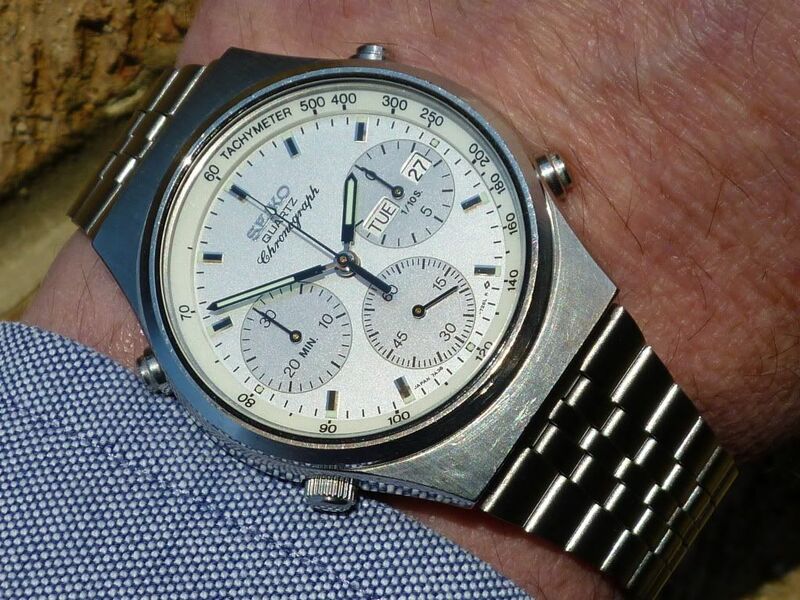 The 726L(XS13) dial, which is unique to this German market model, is really more silvery-white than it came out in my photo, but difficult to capture. Prompted by my purchase earlier this morning of 2 more NOS Orient J39 Divers, I got out my collection box which holds the bulk of them (with a view to figuring out how to rearrange them to accomodate the incomings - fat chance.) 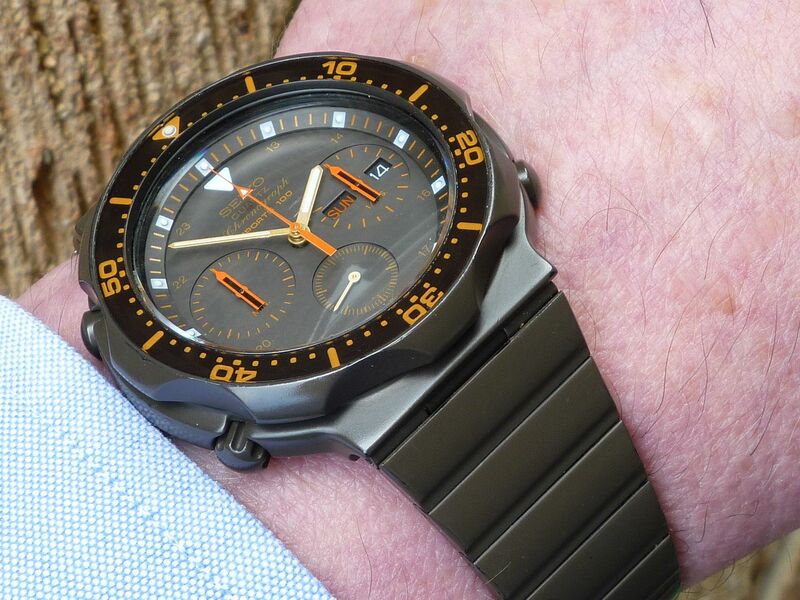 Noticed a couple were doing the two-second two-step (low battery indicator), including this one - my original gunmetal two-tone J39601-70, purchased from German collector Kurt, back in January 2010. It may not be mint, but it will always hold a special place. Actually, I got that wrong. 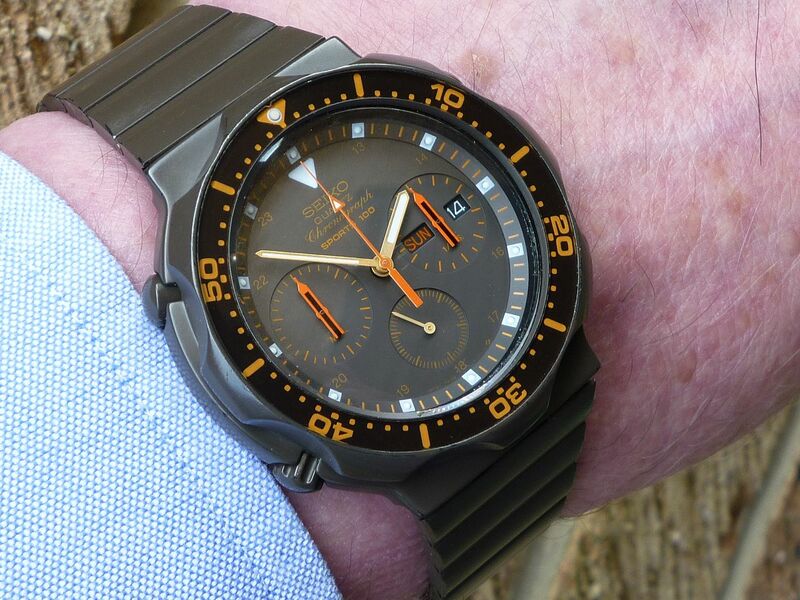 That wasn't the Orient J39601-70 which I bought from Kurt in January 2010, but another similar gunmetal J39601-70 that I bought off eBay Germany (for less than half the price) in December 2013. It wasn't in such good cosmetic condition (and I should have recognized it as such). 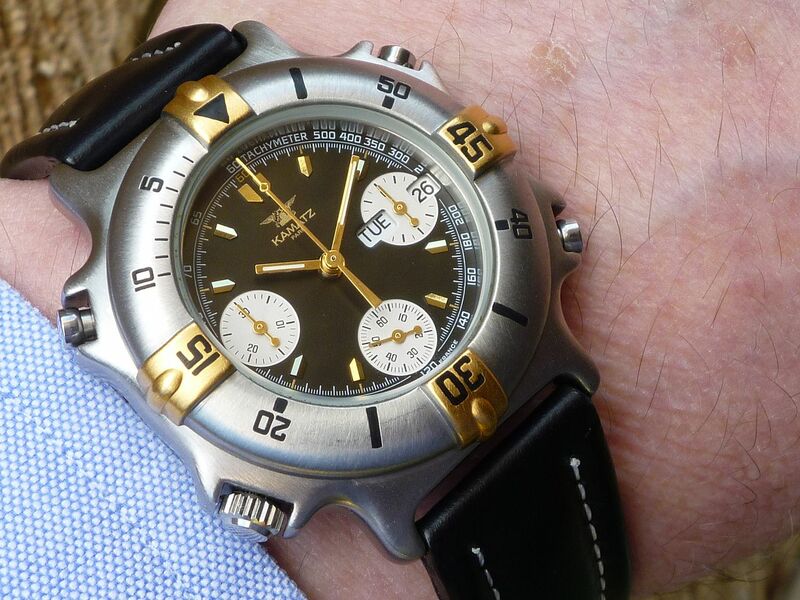 Where I managed to confuse myself is that Kurt's watch came fitted with a non-original generic gunmetal coloured clasp with 6 pairs of adjustment holes. When I bought the second one, it came with the correct original short Orient logo'd clasp and a couple more bracelet adjustment links. So as it was in better overall condition, I swapped those over onto the ex-Kurt watch. I'd simply forgotten I'd done that. That photo wasn't very good anyway and once I realized my mistake I was almost tempted to delete my previous post. But what the heck - Stet ! That black(ish) dial with gold printing is a bugger to capture in all but the perfect lighting conditions (and I failed abysmally this morning). 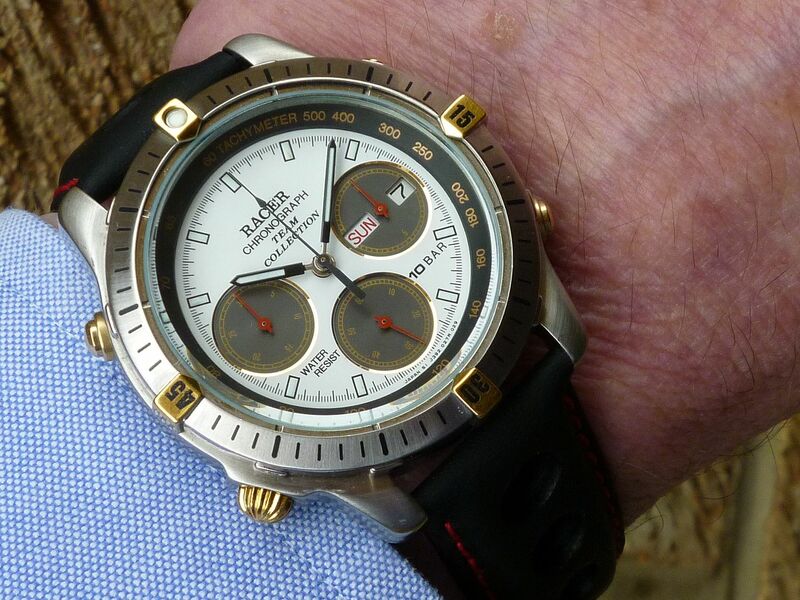 So, to compensate, here's another couple of slightly better shots of another of my favourite Orient J39 'Divers'. 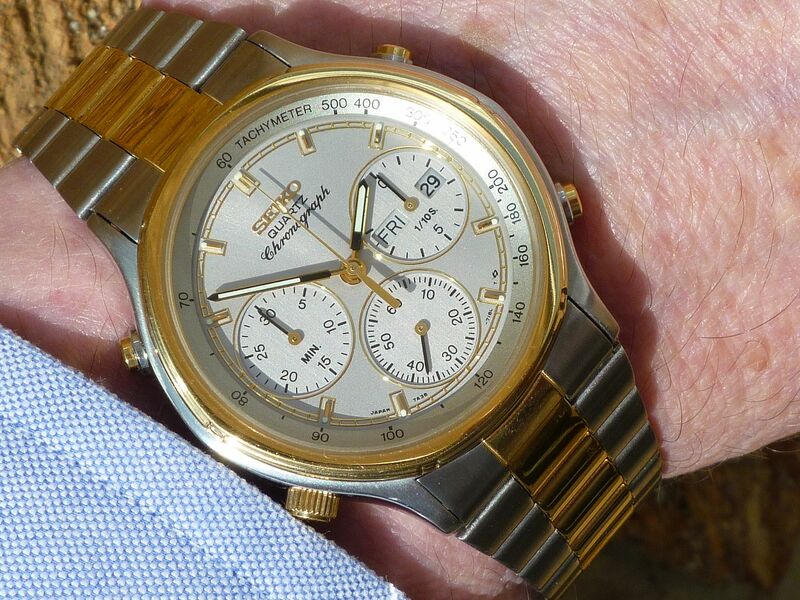 My ex-Wimstore stainless J39701-70 'Freebee' (fitted with a non-original Seiko p/n G1410S bracelet). 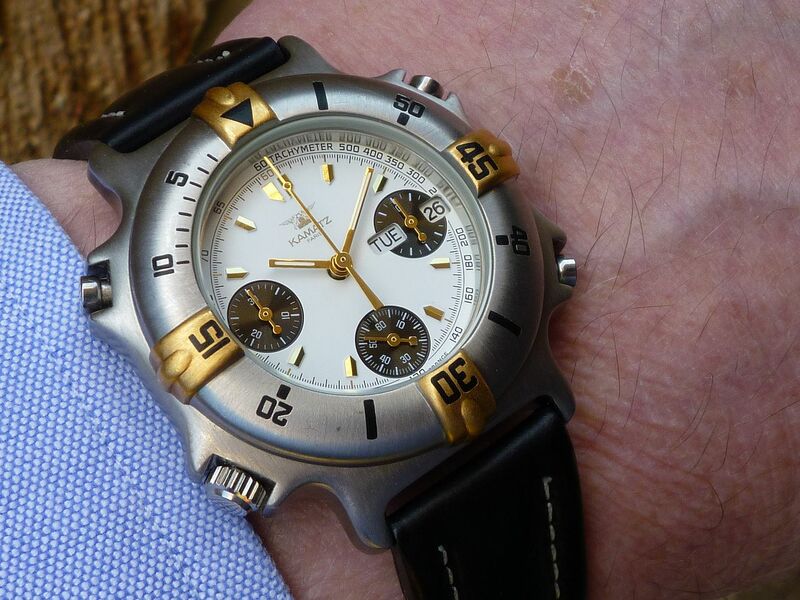 I wasn't planning to wear this today, but as I had to get it out, earlier this morning, to take a photo of the case-back, to illustrate my most recent post in the 7A38-xxxx model specific thread, I thought I'd give it some wrist time. My 7A38-724A SAA086J. Something from the same collection box, which hasn't seen the light of day in a while. 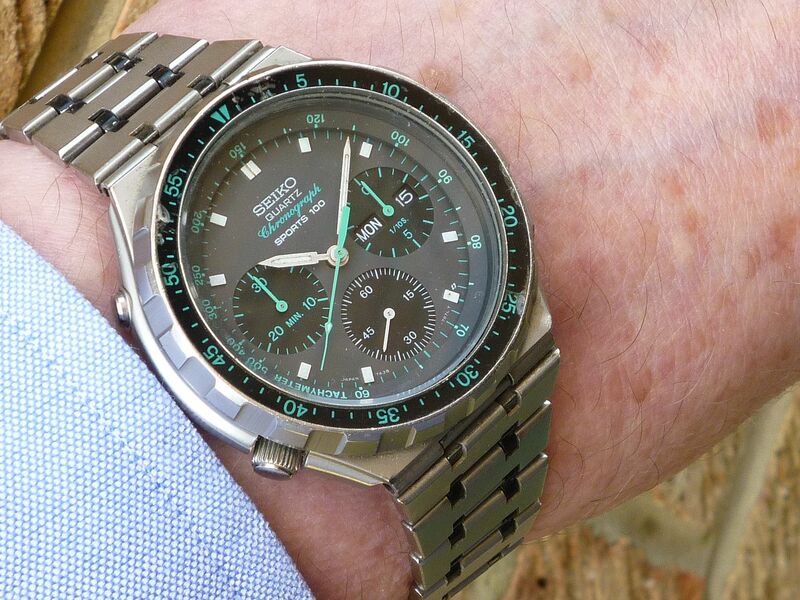 A common-or-garden two-tone 7A38-7260 (SAA098J), fitted (by me) with a non-original Seiko p/n Z1623C bracelet - just to bling it up a bit. Did it years ago, but still can remember it took me ages radiusing those end pieces to my satisfaction. Yema Spationaute III Aragatz ('Cadran Drapeaux') this morning. 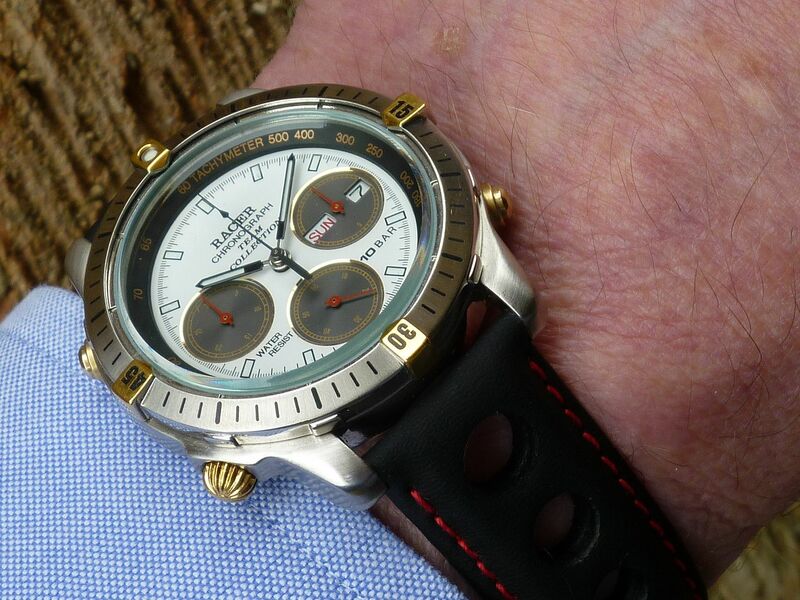 Here's a Q&D as received wrist shot of my recently acquired RACER J39027-70 Breitbling clone, still fitted for the time being at least, with the 'wrong' bracelet it came supplied fitted with. Stainless 7A38-7020 SAA009J cheap 'beater' this afternoon. 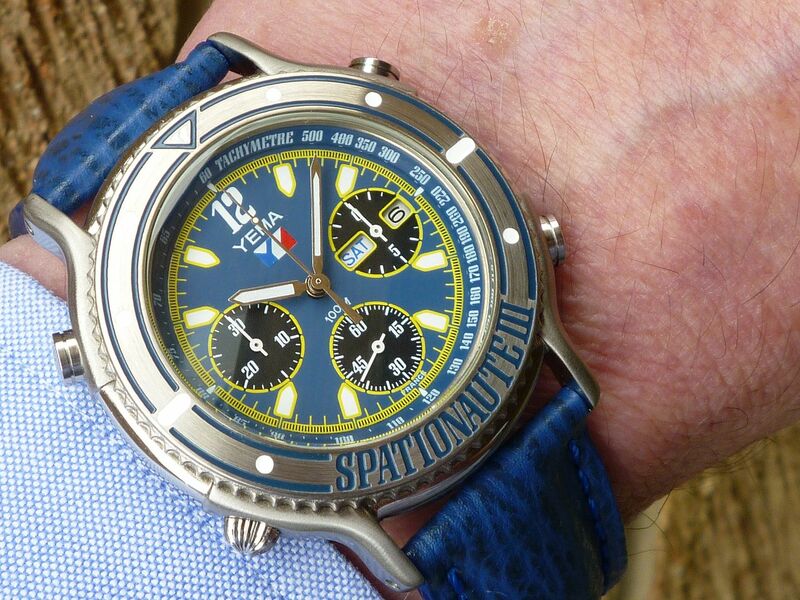 Yema Spationaute III Aragatz - an old favourite - pet name Grande Bleu. 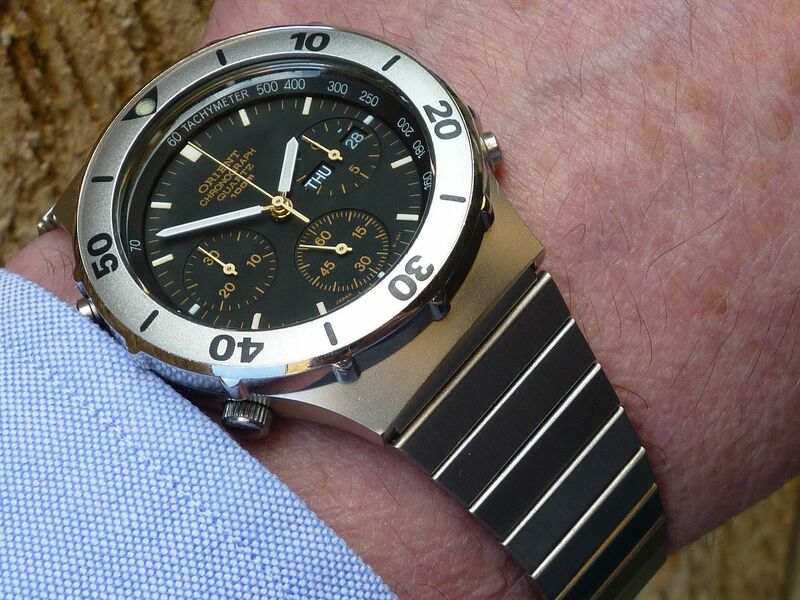 My recently acquired RACER J39027-70, now fitted with a Tissot 'Racing' strap in place of that bloody 'orrible two-tone bracelet. 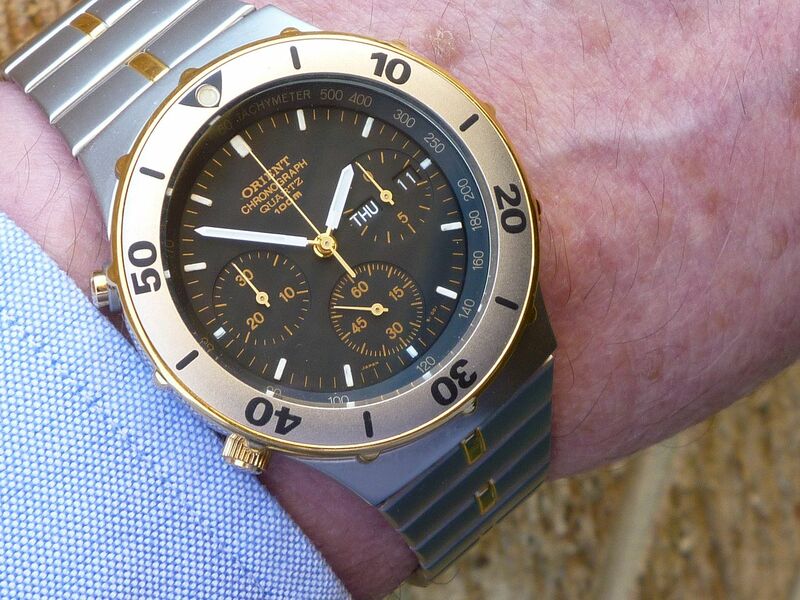 A Q&D 'as received' shot of (one of) my newest incoming Orient J39001-70 Divers. 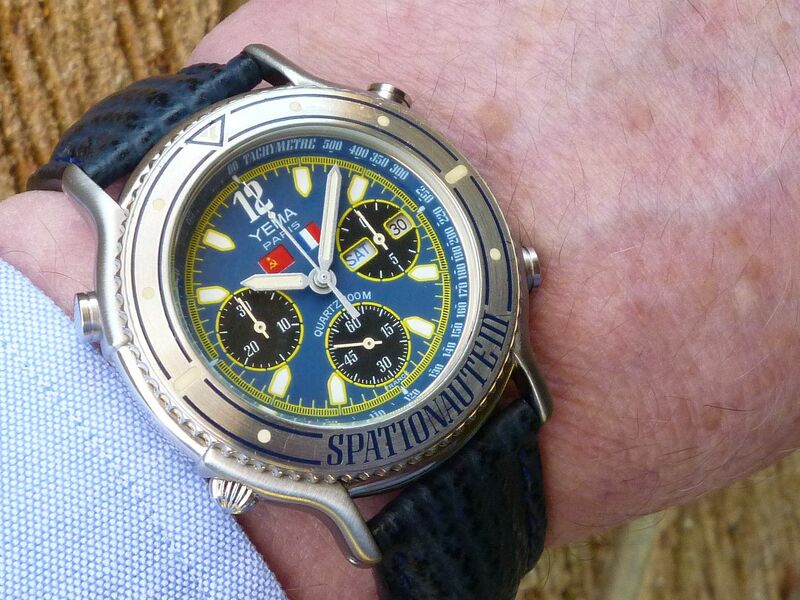 Yema Spationaute III Aragatz on original Yema navy strap this afternoon. Something a bit topical lately. 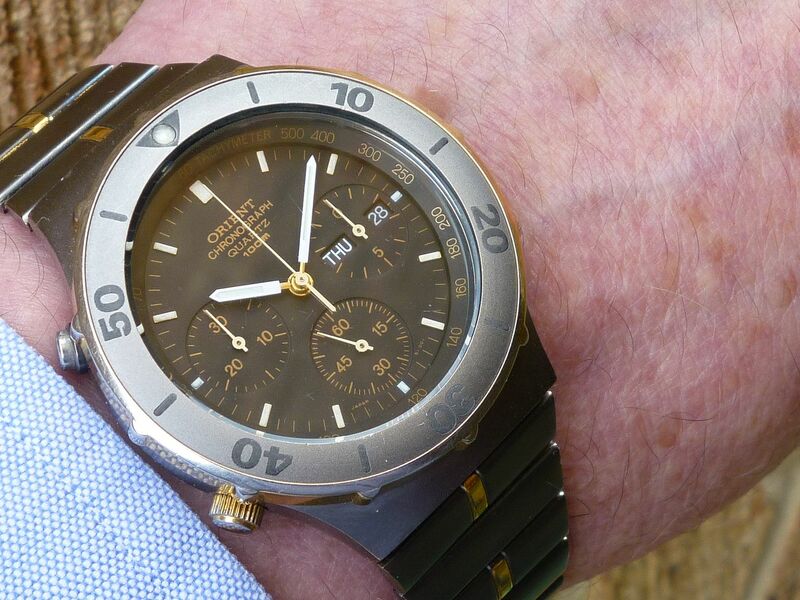 Seeing as I hadn't worn mine in ages, I dug out my chocolate brown-coated 7A38-6020 SAA043J and gave it a bit of wrist time today. 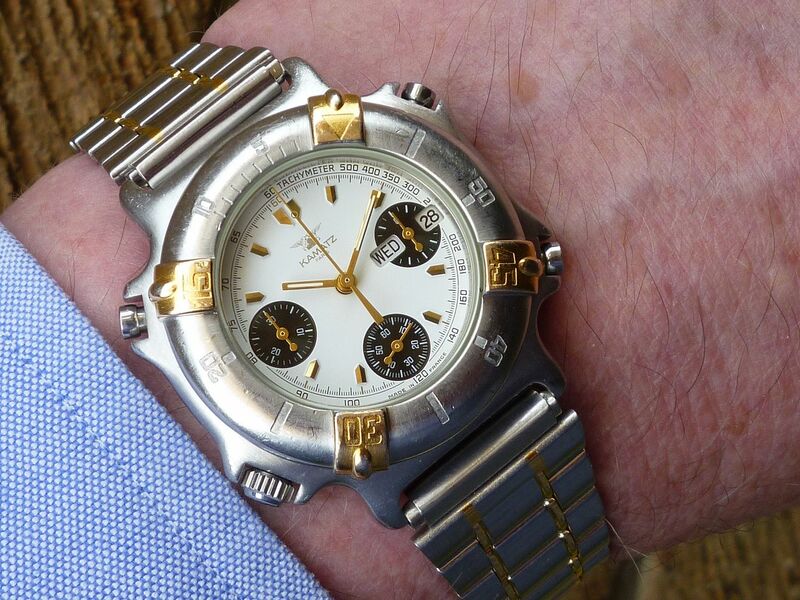 I bought this 7A38-7050 off eBay Italy a week ago, with the intention of breaking it up for spare parts (nominally the crystal and bracelet), to improve 2 of my other examples. The postman delivered it this morning, about half an hour ago (hence the Q&D 'as received' shot). It's got a couple of minor issues (easily resolved), but it really is too nice to break up. Guess I've got myself another resto' project.